The President of Iceland (Icelandic : Forseti Íslands) is Iceland's elected head of state. The incumbent is Guðni Thorlacius Jóhannesson, who is now in his first term as president, elected in 2016. Bessastaðir is today the official residence of the President of Iceland and is situated in Álftanes, not far from the capital city, Reykjavík. 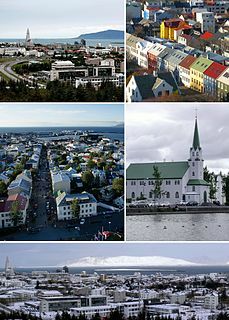 Garðabær is a municipality in the Capital Region of Iceland. A referendum was held in Iceland between 20 and 23 May 1944. Voters were asked whether the Union with Denmark should be abolished and whether to adopt a new republican constitution. Both measures were approved with more than 98% in favour. Voter turnout was 98.4%, and 100% in two constituencies, Seyðisfirði and Vestur-Skaftafjellssýsla. 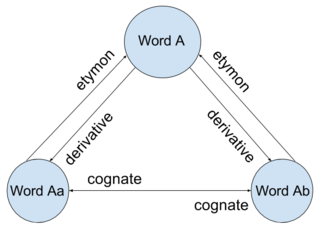 Etymology is the study of the history of words, their origins, and how their form and meaning have changed over time. By extension, the term "the etymology " means the origin of the particular word and for place names, there is a specific term, toponymy. Forseti is the god of justice and reconciliation in Norse mythology. He is generally identified with Fosite, a god of the Frisians. Jacob Grimm noted that if, as Adam of Bremen states, Fosite's sacred island was Heligoland, that would make him an ideal candidate for a deity known to both Frisians and Scandinavians, but that it is surprising he is never mentioned by Saxo Grammaticus. The Cabinet of Iceland is the collective decision-making body of the government of Iceland, composed of the Prime Minister and the cabinet ministers. Sveinn Björnsson was the first President of the Republic of Iceland (1944–1952). Ásgeir Ásgeirsson was the second President of Iceland, from 1952 to 1968. He was a Freemason and served as Grandmaster of the Icelandic Order of Freemasons. Dr. Kristján Eldjárn was the third President of Iceland, from 1968 to 1980. A veto – Latin for "I forbid" – is the power to unilaterally stop an official action, especially the enactment of legislation. A veto can be absolute, as for instance in the United Nations Security Council, whose permanent members can block any resolution, or it can be limited, as in the legislative process of the United States, where a two-thirds vote in both the House and Senate may override a Presidential veto of legislation. A veto may give power only to stop changes, like the US legislative veto mentioned before, or to also adopt them, like the legislative veto of the Indian President, which allows him to propose amendments to bills returned to the Parliament for reconsideration. The current Constitution of France was adopted on 4 October 1958. It is typically called the Constitution of the Fifth Republic, and replaced that of the Fourth Republic dating from 1946. Charles de Gaulle was the main driving force in introducing the new constitution and inaugurating the Fifth Republic, while the text was drafted by Michel Debré. Since then the constitution has been amended twenty-four times, most recently in 2008. The Constitution of the Republic of Lithuania defines the legal foundation for all laws passed in the Republic of Lithuania. 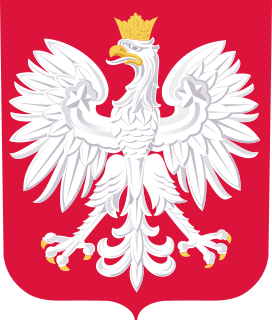 It was approved in a referendum on 25 October 1992. Estonia elects a legislature on the national level. The Riigikogu has 101 members, elected for a four-year term by proportional representation. A head of state - the president - is elected for a five-year term by parliament or an electoral college. Locally, Estonia elects local government councils, which vary in size. Election law states the minimum size of a council depending on the size of municipality. Local government councils are elected by proportional representation too. The President of the Lebanese Republic is the head of state of Lebanon. The president is elected by the parliament for a term of six years, which is not immediately renewable. By convention, the president is always a Maronite Christian. The Constitution of the Republic of Korea is the basic law of South Korea. It was promulgated on July 17, 1948, and was last revised on October 29, 1987. ↑ "Hvað gerir forseti Íslands og hvaða völd hefur hann?". Vísindavefurinn. Retrieved 2016-12-31. ↑ Jóhannesson, Guðni Th. (2016). Fyrstu forsetarnir. p. 196. ↑ Jóhannesson, Guðni Th. (2016). Fyrstu forsetarnir. p. 57.